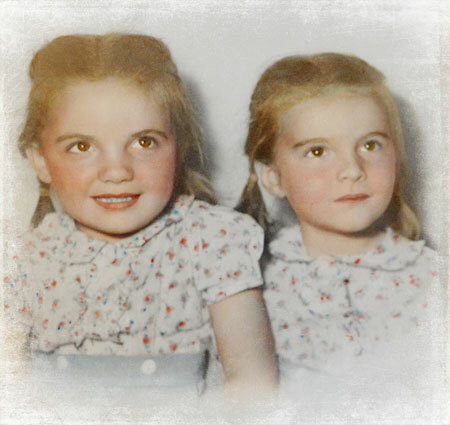 This is my mom (on the left), and her twin sister. Today, they turn 70. Sandy and Patty… Not identical twins, but close enough. Still inseparable after all these years, still driving each other crazy in the way that only siblings can, still sharing that special bond that only twins have. They’ve been through so much together. Aunt Pat lives with my parents much of the time these days, splitting her time between there and her children’s homes. She is the comedienne of the pair, while my mom is the straight man, er, woman. Together, they are a riot. There is never a dull moment when these two are around. Aunt Pat also has twins, and she named them the same names, Sandy and Patty. This has always made me smile. My mom is the oldest, born just a few short minutes before my aunt. So, of course, she is the boss. Last Sunday we had a big party for them, and we laughed at this photo, and how much they still look like these adorable little girls. Anyone who brings joy and laughter with them, inspires such devotion from such a wonderful heart has to be very special indeed. Bappy Hirthday, Young Ladies. May the best of his past year be the worst in the coming year. Happy Birthday, Sandy and Patty! Adorable! My sisters are twins so I understand what a special connection that is! this touched my heart …HAPPY Birthday and many more years of laughter and fun!! That picture is adorable! Little sweetcake rosy cheeks. Happy Happy Birthday Sandy & Patty!! Eat lots of cake and blow out all the candles and may all your wishes come true. Happy happy birthday dear Sandy and Patty! So beautiful then and I bet even more gorgeous now. This post made me smile and feel like my world has gotten brighter knowing about the two of you. How wonderful to celebrate two fabulous women!! Sending a rainbow of happy butterflies to the birthday girls and everyone celebrating with them!! Happy birthday! WOW. Twins and more twins. What a special relationship, so I have heard over the years. Happy, happy birthday to the twins. Happy Birthday to Sandy and Patty! Hope you both have a love-filled day! Precious picture. Kelly, your mother looks so much like you; I guess it’s you that looks like her. Have a beautiful birthday, double trouble. Happy Birthday Sandy and Patty! Many blessings. Happy birthday Sandy and Patty! Long may you be crazy nuts! Heavens, they just stole my heart. My favorite part was about your mom being boss because I am the eldest, my brother is three years younger. Happy Birthday to Sandy and Patty! May your years be filled with joy, family, and love. Happy Birthday! Anybody who makes Kelly this happy deserves all of the best. Hope today is wonderful for both of you. Happy Birthday Sandy & Patty!! What a great gift to travel with a twin! Oh my goodness, what a beautiful photograph! And how special it must be to be a twin! Happiest of birthdays, Sandy and Patty! (And I love that Pat named her twins Sandy and Patty!) May your days be filled with love, laughter, and meaning! Happy Birthday!!!! I hope your day has been filled with joy, laughter, and unexpected blessings!! I hope you had a fabulous day, and here’s to many more! We have two sets of twins in my family. My two brothers, and a sister and brother are all twins.